"Was it your idea to bring back the character of Supergirl or was it something that DC said needed to be done?" "JB: That was my idea. I felt it was probably not a good idea to let the copyright on the name slip away, and, what the heck! It was a chance to do a storyline guaranteed to mess with some heads, a significant part of my job description! Unfortunately, several coloring errors -- Supergirl being a redhead when she should have been a blonde, etc, tipped the hand and made the story, probably, even MORE confusing than it was meant to be! 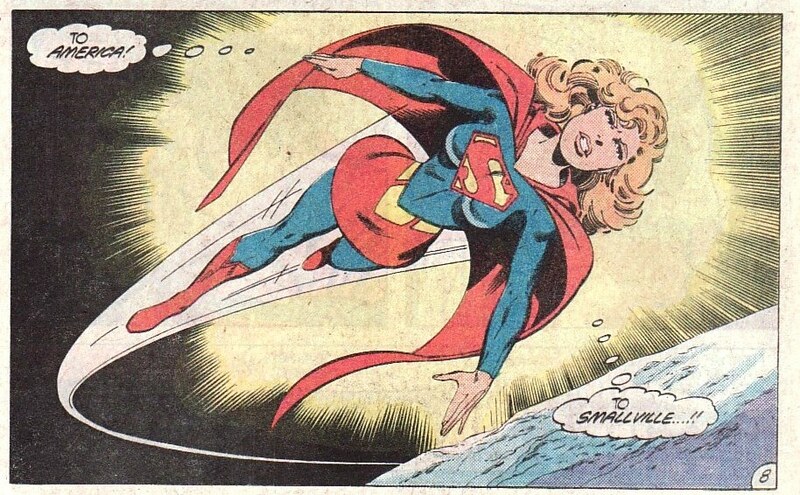 (11/2/97) I planned to have her as a recurrent character in the Superman titles. When I left the book, Roger Stern came up with the "Matrix" angle, and progressed her story from there. (10/9/2005)"
Anyway... yes, this was a blatant bait-and-switch. DC could get away with this kind of tactics back then because online communities were in their childhood, but I can't imagine this sort of "we're going to bring your favorite back, just not" strategy would go well nowadays. Did Byrne plan for Supergirl to be a sort of "SuperLana" or did he have some other concept in mind? It couldn't be any more convoluted and contrived than the eventual Matrix Origin believe me...and to think fans used to complain about the silver age Supergirl's allegedly hackneyed origin, its a model of sparse simplicity by comparison. She does reveal herself to be imprinted from Lana in that arc. But quickly she adopts the blond hair and more classic 'non-Lana' SG look. A woman found in ice dressed similarly to Superman (and reminiscent to readers, of course, of Supergirl) was a promising and intriguing start. 1) Lex sent her back to the distant past to give Superman "more time" to find her. That's just - silly. I forget if it was intended for her to land in ice - if it was, it's even less likely a time-travelling Superman would have found her. If it wasn't, well then Super-Lana would have had a longgggg boring time waiting even for baby Kal-El to arrive on earth, while hoping grown-up time-travelling Kal-El would find her. It seemed to me that all they had when they started the story was the intriguing 1-page teasers over the course of many months, and struggled to reverse-engineer something semi-coherent. And boy was the purple Matrix-slime just gross! Wish they had found a somewhat more appealing version of the Matrix essence. 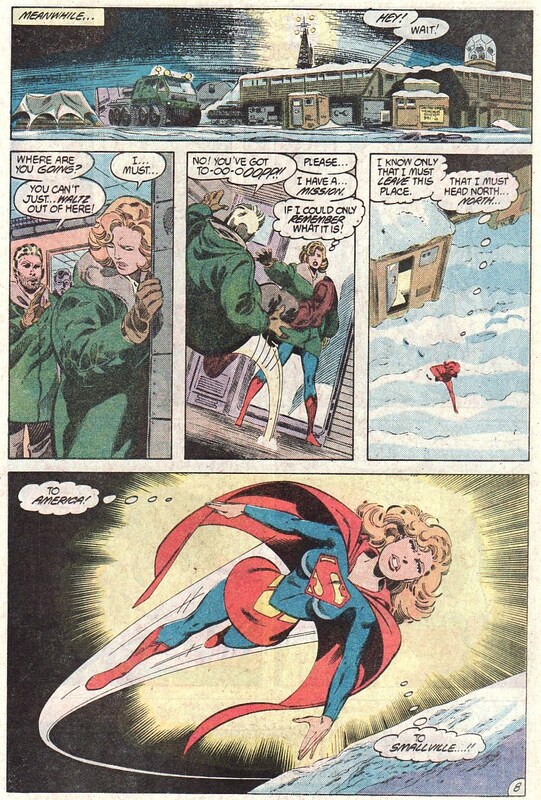 "Did Byrne plan for Supergirl to be a sort of "SuperLana" or did he have some other concept in mind? 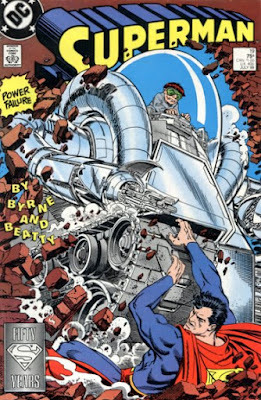 It couldn't be any more convoluted and contrived than the eventual Matrix Origin believe me... and to think fans used to complain about the silver age Supergirl's allegedly hackneyed origin, its a model of sparse simplicity by comparison." "It seemed to me that all they had when they started the story was the intriguing 1-page teasers over the course of many months, and struggled to reverse-engineer something semi-coherent." Well, I like JB's art, but he isn't the great plotter and writer their more ardent fans would like believing he is.